Omega-3 fatty acids are not all created equal. Eicosapentaenoic acid (EPA) and docosahexaenoic acid (DHA) are found primarily in fish and so are called “marine” omega-3s. Alpha-linolenic acid (ALA) is found in plant sources — flaxseed, walnuts, canola oil, soybean oil. Heart attacks, stroke and cardiovascular death — by reducing blood clotting, irregular heart rhythms, triglycerides (a blood fat) and perhaps arterial plaque. Cognitive decline and depression — by combating inflammation, improving function of nerve cell membranes and boosting brain chemicals that help nerve cells communicate. Some types of arthritis and bowel disease — by easing inflammation. Bonus: Omega-3s may reduce menstrual cramps and menopausal hot flashes in some women. How much do you need? Adults should eat dark oily fish (such as salmon, tuna, herring, sardines, trout or mackerel) at least twice per week. This provides 400 mg to 500 mg of combined EPA/DHA per day, on average. If you have heart disease, get 1,000 mg of EPA/DHA daily… if you have high triglycerides, your doctor may recommend 2,000 mg to 4,000 mg daily. It’s hard to eat enough fish to meet the higher dosages, so consider supplements. Advantage: Whereas fish may be contaminated with mercury and polychlorinated biphenyls (PCBs), Consumer Reports found that none of the 16 major fish oil brands tested contained significant amounts of these toxins. 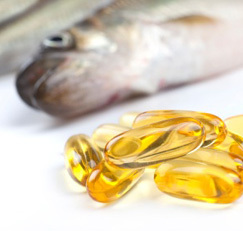 Many fish oil capsules are only about 30% EPA/DHA — so look for a product with more concentrated EPA/DHA. If you have high triglycerides, ask your doctor about a new prescription fish oil supplement that has 840 mg of EPA/DHA per 1,000-mg capsule. Fish oil can thin the blood and trigger excessive bleeding in some people — so do not take more than 3,000 mg daily without your doctor’s okay. Check with your doctor before taking any fish oil if you use medication that affects blood clotting, such as aspirin, warfarin (Coumadin) or clopidogrel (Plavix). If you prefer not to consume fish products, get 1,000 mg to 2,000 mg of ALA per day from ground flaxseed, flaxseed oil supplements or other sources. To avoid gastrointestinal upset, start at a low dose and gradually build up… and drink a glass of water with each dose. Consult your doctor before taking high doses of flaxseed if you have a personal or family history of breast cancer or another hormone-sensitive condition — flaxseed contains substances than may have estrogen-like effects. Source: JoAnn E. Manson, MD, DrPH, a professor of medicine and women’s health at Harvard Medical School, and chief of the division of preventive medicine at Brigham and Women’s Hospital, both in Boston. She is one of the lead investigators for two highly influential studies on women’s health — the Harvard Nurses’ Health Study and the Women’s Health Initiative. Dr. Manson is the author, with Shari Bassuk, ScD, of Hot Flashes, Hormones & Your Health.